When the Football Association board meets at Wembley on Wednesday, one topic will be of particular interest. The latest twist in the unravelling of the basket-case that is Fifa. Because, with less than four weeks until nominations close for February's election of a new president of football's world governing body, the FA knows that mounting uncertainty surrounds the candidacy of the man it is backing to lead football into a new era. Having been dragged into the corruption scandal that has engulfed world football's governing body, Uefa supremo Michel Platini's reputation and campaign is on the line, the Frenchman under mounting pressure to fully explain the £1.35m he received in 2011 from Fifa president Sepp Blatter for work he supposedly undertook between 1998 and 2002. Blatter faces criminal investigations for what the Swiss attorney general Michael Lauber has described as a "disloyal payment". Both men deny any wrongdoing, and Platini has now launched a belated fightback, insisting in an interview with French news agency AFP that the delay was because Blatter had told him it was not initially possible to pay him in full for his services as a consultant due to Fifa's "financial situation". Why he did not say this publicly last week when he was first questioned by Swiss prosecutors is unclear. It has not gone unnoticed, of course, that according to Fifa's 2002 official finance report between 1999 and 2002 the organisation enjoyed surplus revenue of 115m Swiss francs (about £80m at the time), making it hard to accept that the body could not afford to pay Platini his fees. What also makes all this so awkward is that shortly after Platini received the money in 2011, he backed Blatter's re-election as Fifa president, deciding not to stand against him. Platini says that the this had nothing to do with the money he received, and that the timing was merely a coincidence, but for many, when Fifa is already on its knees after years of corruption allegations and in desperate need for transparency and integrity, the fact that the favourite to be its next leader is being treated by the Swiss authorities as "between a witness and an accused person" (according to Lauber), is a cause of grave concern. Platini has vowed to clear his name, and told AFP that he was "calm and totally serene", but with Fifa's ethics committee looking into the affair, and the threat of a suspension hanging over his candidacy, Platini's chances of winning the election - previously regarded as a formality - appear to be in danger. Platini may not know whether he faces suspension before the vote in February. If the life ban handed to disgraced former Fifa vice-president Jack Warner this week is anything to go by, the ethics committee will be in no rush. Its investigation into Warner began in January after all, and it took nine months to finally punish him. It should also be remembered that Platini must pass integrity checks set by Fifa's election oversight committee to gain a place on the ballot to succeed Blatter. This is all highly uncomfortable for the FA, whose chairman Greg Dyke firmly backed Platini's candidacy in July despite the Frenchman's long association with Blatter, and his admission in an interview with me on a visit to St George's Park in November, that he had "no regrets" over voting for Qatar as World Cup hosts. Dyke had previously described the concept of a summer World Cup in Qatar as "ridiculous". The FA nailed its colours to the mast a full seven months before the election, before they had seen Platini's manifesto, and declined to wait to see which other candidates might stand, ignoring the warning of the man they had supported in June's election - Jordan's Prince Ali - who said that Platini was "not good for football". Three weeks ago, FA chief executive Martin Glenn explained at the Soccerex conference in Manchester why his organisation had supported Platini, emphasising that it would be beneficial to English football. After years of being on the sidelines of Fifa, it was perhaps understandable that the FA took a distinctly pragmatic approach, and backed the favourite - the head of their confederation - a man who would represent their interests. The FA was by no means alone. Platini enjoyed the support of national associations around the world, including the Scottish FA. He had demonstrated a shared interest in the importance of homegrown players. He had opposed the re-election of Blatter. But many will now wonder if the FA - who had led calls for a fresh start for the sport - were way too hasty. 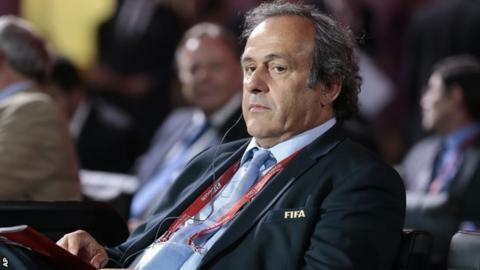 Privately the FA is known to be growing impatient with Platini, and - like other national associations around Europe - is understood to be seeking assurances and answers from him after a letter he wrote to them this week failed to explain the timing of the payment he received. Whether the further details he offered up via AFP satisfy the FA board - as well as his key supporters from the Asian Football Confederation, Sheikh Salman and Sheikh Ahmad al-Fahad al-Sabah - remains to be seen, and could decide his future. As the FA's guest of honour at this season's Community Shield at Wembley, Prince Ali was given a standing ovation, and thanked for the role he had played in Blatter's downfall. If Platini were to withdraw from the election, be prevented from standing, or deemed too discredited, it will be fascinating to see whether the FA once again turns to the Jordanian as an alternative. "There are times in life when you have to take your destiny into your own hands," said Platini in July when declaring he would stand. The 60 year-old's fate may now be beyond his control.